ABC News Special: Crowds gather to witness solar eclipse in Lincoln, Oregon — among the first sighting in North America 2017. Crowds at Carhenge in Nebraska eager to view solar eclipse. It’s the first such eclipse to go from the west to east coasts of the US in 100 years. Experts warn never to look directly at the Sun with the naked eye. PBS WATCH LIVE: NASA coverage of the Aug. 21, 2017 total solar eclipse (archived). 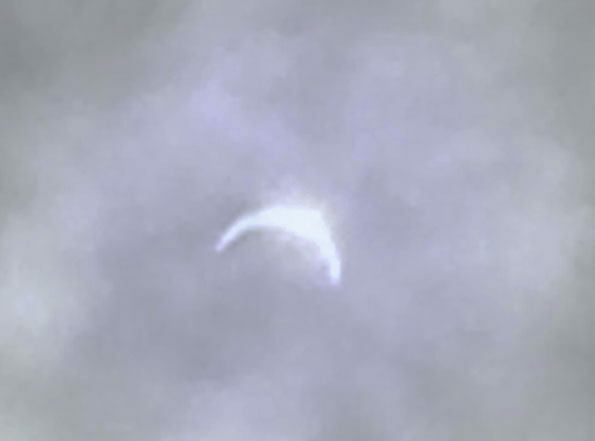 Solar Eclipse 2017: Crescent Sun in Arlington Heights appears for a short time during a break in thick cloud cover about six minutes after the maximum solar eclipse of 87.71% at 1:22 p.m. on August 21, 2017. Solar Eclipse 2017 live stream coverage (archived). 2017 Solar Eclipse (Full) | NBC News (archived). Total Solar Eclipse at Grand Teton National Park, Wyoming. Street Cam Solar Eclipse Jackson,Wyoming. In what promises to be the most observed and photographed eclipse in history, the start of a total solar eclipse was first seen from Madras, Oregon.